The scroll lock key can be a mystery to many. Most keyboards still have one although they are slowly disappearing due to atrophy and becoming vestigial parts from a distant past. I am well-familiar with the “old days” and even I can’t remember a time I ever used it. What Is Scroll Lock Used For? In the days before the ubiquitous mouse existed, people used the arrow keys on their keyboards to navigate through their favorite programs. The scroll lock key changed the behavior of these keys. Let’s say you were using a spreadsheet program. Way back when, you would use the arrow keys to move your focus from cell to cell. We still do this today. But let’s say, for the sake of argument, that you wanted to scroll the entire page? You could still use the arrow keys to move across a number of cells until the page started scrolling, or you could hit the scroll lock key. Once that was enabled, your arrow keys would now scroll the page instead of moving a single cell at a time. Surprise!! 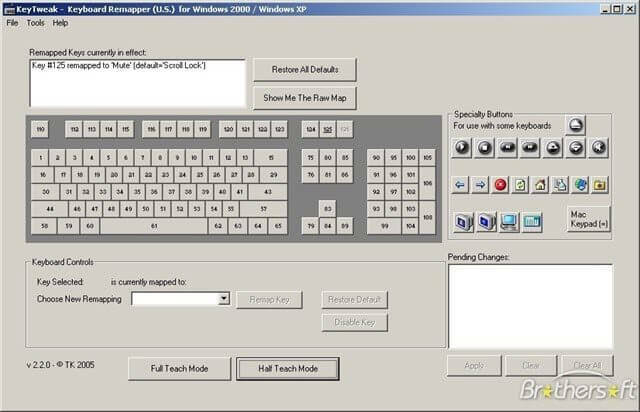 This still works today and might actually be useful if you want to keep your hands on the keyboard. Try it out for yourself. You might find it mildly entertaining. Once you have gotten bored playing with the scroll lock key, which I am quite sure will eventually happen, you may wonder if there is a way to put it to some state-of-the-art use. There is and it’s called remapping. There are many remapping utilities available on the internet and, as always, some will be better-suited to your needs than others. As with any freely available software on the internet, make it your business to do some research and try to find reputable sources. The bad guys are ever-present and vigilant. There are many ways to make the scroll lock key very useful. You can remap it to a single other keystroke or run an entire macro which is a powerful option. The scope of your imagination is the only limitation here. Think of it as a free macro key which normally only appears on higher-end keyboards. Note: I have not tried either of these utilities so I leave you to your own devices. There are perhaps hundreds more from which to choose, but these two seemed to be at the top of most lists I saw. Try them out and let us know what you think. Sadly for me, it is Scroll Lock/Light for the keyboard, so on or off it doesn’t work. Edumacate me– what does “Scroll Lock/Light” mean? Cooler Master made the Scroll Lock button to turn on the keyboard light. So, it still has SCR LK printed on it, but it doesn’t work like it, it should. I press scroll lock and press the down arrow, it scrolls down on its own? Or what am I missing? It all depends on what program you are trying it in. I used the spreadsheet example in the article because I know it works in those programs. In your browser, for example, you probably won’t see any difference. The Logitech software allows me to program a lot of the other keys. It is true that some manufacturers are no longer including a Scroll Lock key on their machines. Please take this question to the DCT Forums. With SCROLL LOCK on in Excel, the spreadsheet scrolls one cell at a time with the focus still remaining on a given cell (and the entire page does NOT move as you stated). With SCROLL LOCK off, the focus changes to the next cell (and does not remain fixed as before). Today I do not have any Scroll Lock key on my laptop. I have a cordless mouse but with no battery in it, fortunately the touchpad works jolly good. There is no led to show the keyboard’s state, either, so it is somewhat of a whole topic to know whether I am going to type a lowercase or an uppercase letter. Fortunately I wrote a program for that a few years ago, and I now have that on the screen. I recognized caps lock and insert with it, and did not find how to set the scroll lock mode. There is a “Pause/Attn” key, I thought it was that, but it seems not. When I have time for it I shall try and get its code. but something happened so that it is no more visible here. Anyway, you probably saw the newsletter, the program addLEDS from wintools.info does the same, much better. Yes, I saw DCT’s link but thanks for your followup.